In the wake of the semi-truck attack in Nice, France, the question has to be asked: Would such an attack have been successful if that country had a Second Amendment? After all, Breitbart News previously reported that France not only has every gun control Democrats want to implement in the U.S., but also more stringent controls than countries can put in place when gun ownership lacks constitutional protections. These controls include bans on whole categories of weapons, as well as background checks that require would-be gun owners to acquire and maintain “an active shooting club [membership]” and go to the range “at least three times a year,” according to A Review of French Gun Laws. The controls also include “seeing a doctor every year” — a doctor who must declare the individual “physically and mentally capable of owning a firearm.” And there is even more paperwork. But none of this prevents an attacker from using a semi-truck to run innocents down. 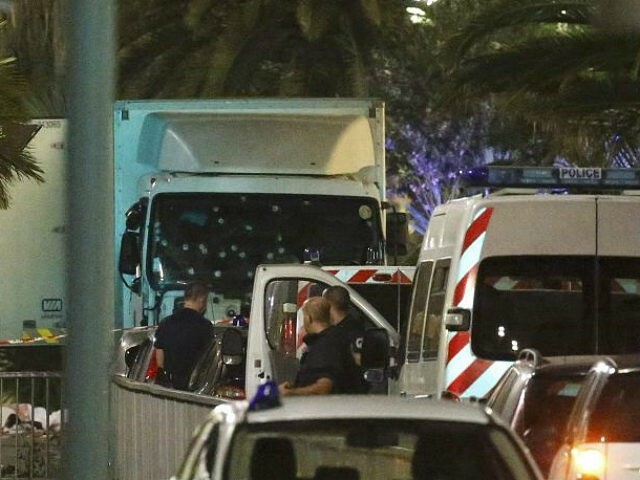 When the truck crashed into crowds during Bastille Day in Nice — killing at least 80 — armed French police were eventually able to shoot and kill the driver. But how much sooner might he have been stopped if the citizenry at large was armed? How many fewer people might have been killed if citizens on the scene had been able to open fire immediately? To take out the driver as soon as they realized the driver was intentionally driving over innocents? In Israel, armed civilians have stopped several would-be Islamist terror attacks using vehicles to target crowds of civilians. In 2008, for example, an armed civilian helped stop a terror attack in Jerusalem in which the assailant was trying to kill people by driving a bulldozer. Think about it this way: What if the driver had barreled into a crowd in Texas, the state with laws Obama complained about when he criticized open carry last week? Show far would the trucker have made it if trying to run down Texans with AR-15s slung across their shoulders? Someone may suggest that the U.S. suffers terror attacks even though gun rights are constitutionally protected, but that argument overlooks the fact that successful terror attacks often occur in places where citizens are barred from carrying guns via gun-free zones. The best examples of this are actually the most recent — namely, San Bernardino (December 2015) and Orlando (June 2016). In both these instances, law-abiding citizens were forbidden to carry guns, making it very easy for determined attackers to step up and kill as many innocents as possible before losing their own lives. A reversal of such gun-free policies could have prevented or at least diminished the high number of fatalities in San Bernardino and Orlando. A similar reversal might have allowed French citizens celebrating Bastille Day to cut that semi-truck attack short as well.